Join the new Bondi Cinema Club and see the best of art house and independent cinema at these once-a-month screenings in the Bondi Pavilion Theatre. This insightful touring exhibition looks at the work and life of 'Raoul Wallenberg'. Raoul Wallenberg was a Swedish diplomat, assisting tens of thousands of people to flee Budapest during the Second World War. It is an exhibition about his deed and heroism, but also moral courage, tolerance and personal responsibility. Women in Business is our first of three Business Forums for 2019. Four female entrepreneurs will share their tips for success. This seminar is designed for parents with children aged 10-17, who want practical, effective information and strategies to build stronger parent-child relationships and better manage and understand adolescent behaviour. This seminar will be led by experienced adolescent and family clinicians at WAYS Youth & Family. This exhibition celebrates the work of Australian Environmental Artist Dr. John Dahlsen. Central concerns of his career exemplify a commitment to express contemporary social and environmental concerns, while simultaneously sharing a positive message about the aesthetic experience. The Swedish diplomat Raoul Wallenberg is a reminder that we constantly need to fight racism and stand up for human dignity. Welcome to this discussion about what Raoul Wallenberg's legacy means today. The panelists are all prominent members of the Australian community, using their voices and platforms to influence human rights. Filmed across six continents, filmmakers Danielle Ryan and James Sherwood, have set out to challenge the mainstream narrative hard hitting environmental documentaries with a “doom and gloom” message, and replace it with one of hope and courage. Do you enjoy the coastal walk from Bondi to Bronte and marvel at the monuments in Waverley Cemetery and wonder who is buried there? Why not book a walking tour, led by Friends of Waverley Cemetery Volunteers? The cemetery is the resting place of many famous an infamous people including test cricketers, politicians, murder victims, authors, poets and criminals! Despite endless talk about whether or not climate change is real, one of the world’s most breathtaking natural wonders and destination hub for millions of tourists each year, the Great Barrier Reef – is being brought to its knees. In this free workshop learn how to plant a successful native garden that looks great and provides habitat for our local native animals. This workshop will particularly look at choosing plants that help support our struggling small birds. Shoplifters follows the life of a family living on the edge who turn to petty crime to survive. The film deals with issues of people in poverty who often live with warmth and happiness regardless of their circumstances and what it means to be family. 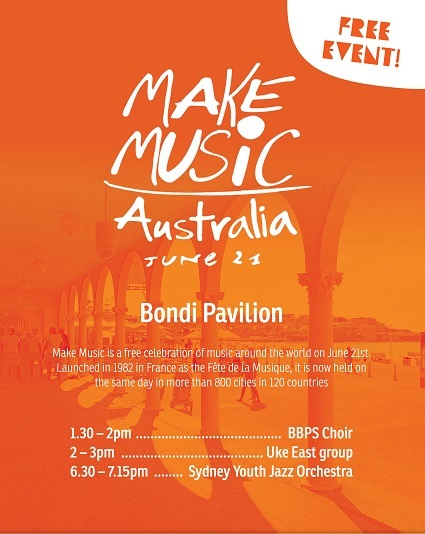 A full list of Youth Week events happening in Bondi and the surrounds listed here. Come to Bondi Beach to celebrate the inaugural Ocean Lovers Festival. This festival will have water sports alongside cultural activities, live entertainment, eco-markets, art, photography and film presentations, workshops, practical demonstrations and information sessions to create awareness and influence positive change in our everyday life to love our oceans more. It’s 100 years since May Gibbs’ adorable characters found their way into the homes and hearts of Australians, and Waverley Library is celebrating with a free travelling display featuring May Gibbs’ iconic artwork. Expect a great line up of some of the world’s most beautiful films about our oceans as part of the Ocean Lovers Festival this April, including the Australian Premier of Jean Michel Cousteau's Wonders of the Sea, surf legend Tom Carroll joining the filmmakers and screening of Storm Surfers 3D and a program packed with the best underwater footage, film maker talks and panelists. This one day intensive storytelling workshop is designed to get your stories off the page and come to life on the stage. If you’re looking to swap your pen for a microphone, this course is for you! The House that Dan Built (The House) returns to the Bondi Pavilion Gallery over the NSW April school holidays to present SALT, a refreshing program written, produced, and performed, by young female voices. By day, enjoy the installation in the Bondi Pavilion Gallery, or get involved in a variety of workshops on offer; and by night, experience a new immersive theatre experience that responds to the Bondi environment, and in particular, SALT. The House will also be bringing you a performance from their Toy Choir, and Aurobindo Project, during this period. Be quick to book your tickets for the performances and workshops, or just come have a look at the installation. Hilary Swank. Leonardo DiCaprio. Juliette Binoche. Tobey Maguire – all acclaimed and celebrated for their powerful work. All coached by Larry Moss 16th Street in association with The Factory welcomes back to Bondi Pavilion Theatre the world’s most acclaimed acting coach. It’s time to get rid of those unwanted, out-of-date or leftover household chemicals from your kitchen, bathroom, laundry, garage or garden shed. Expertly curated and lovingly presented, the Sydney Comedy Festival Showcase will feature some of the Festival’s hottest acts live on stage for an incredible two hours of hard hitting laughter. Boasting a line-up of the best local and international comics alongside some of the freshest emerging talents in the comedy scene, this jam packed night of pure entertainment will leave you sore from belly laughs! During consecutive heat waves over the past four summers, Blackmore documented life on Sydney’s beaches revealing a culture laid bare under an ever-hotter sun.The artist captures the intensity of the crowds, the kinetic energy that emanates from humanity escaping the built environment; bathers absorbing the sun and seeking relief from the heat in the cool water - the sensual, redemptive act of immersing oneself in the enormity of the ocean.